It wasn’t all that long ago, certainly within my lifetime, that people were sent to carry out hard labour in salt mines as a punishment. They probably still are. The Soviets especially liked compelling people to go deep underground (usually in Siberia) to mine the precious commodity but today things have changed and we were actually paying for the privilege. The hotel clerk tried to persuade me to book a personal taxi tour but at forty zlotys more each (£10) this seemed an unnecessary expense so I booked the regular tour instead. This meant that to begin with there was a couple of shuttle bus journeys to reach the final rendezvous point across the river Vistula on the western side of the town where we separated into two groups, one for the Nazi concentration camp tour to Auschwitz and the other to the salt mines just a fifteen minute ride away on the outskirts of the city. It was still rather overcast as we drove the short distance but it was much warmer today and the sun was beginning to compete with the milky clouds by the time that we arrived at the Wieliczka Salt Mine where we left the bus and walked to the entrance to meet our guide for the tour. 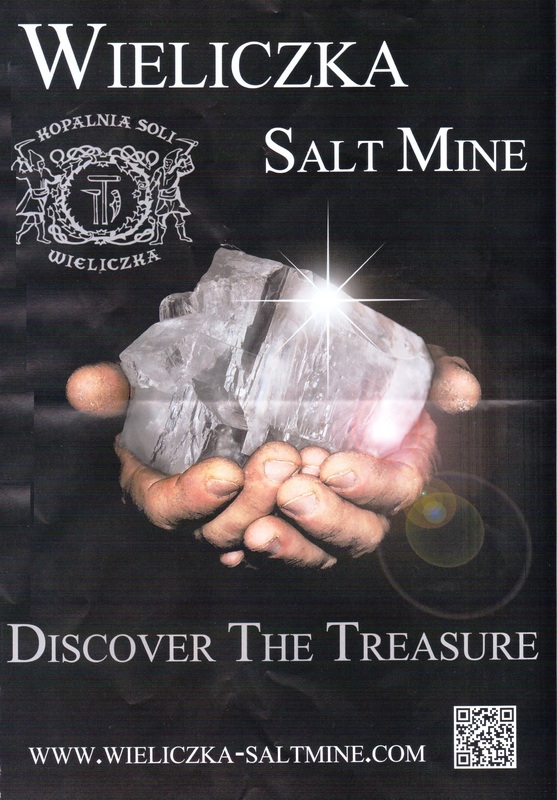 The mine is in the suburb town of Wieliczka that is now part of the greater Krakow metropolitan area and since the thirteenth century has continuously produced table salt. It has been one of the world’s oldest operating mines producing salt for seven hundred years until commercial mining was discontinued in 1996 due to low prices and flooding problems, followed by formal closure in 2007. It now produces just sixty tonnes of salt a day but this is only a by-product of routine maintenance operations. 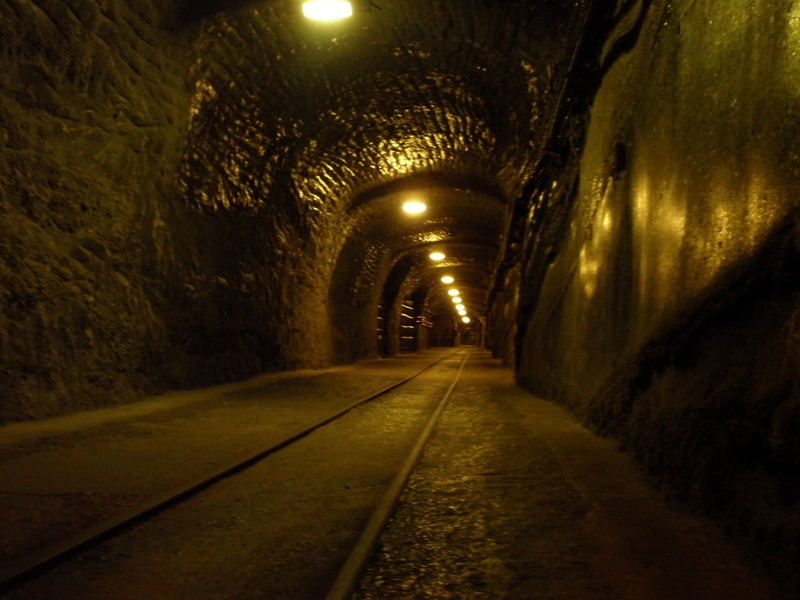 Today the mine is a tourist attraction and about one million, two hundred thousand people visit every year. 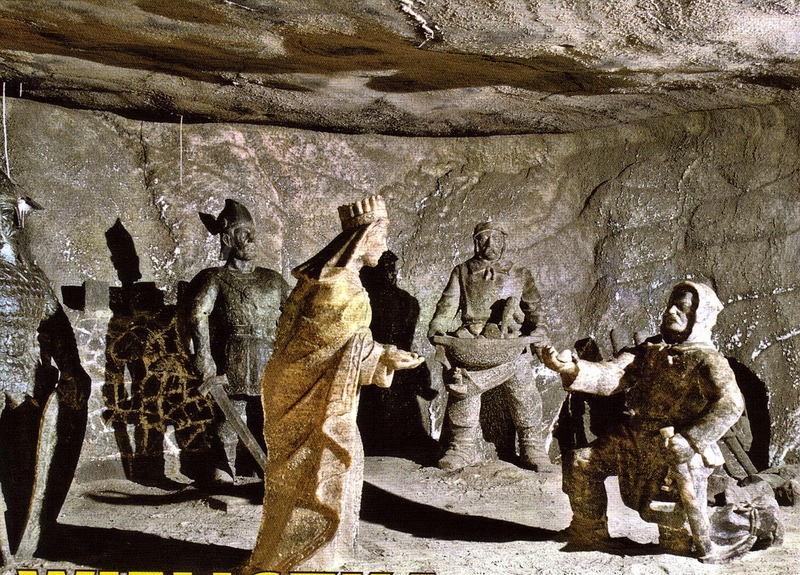 This might seem like a strange sort of place to visit but the attraction is a collection of statues and an entire cathedral that have been carved out of the rock salt by the miners over the years – presumably during their tea breaks. 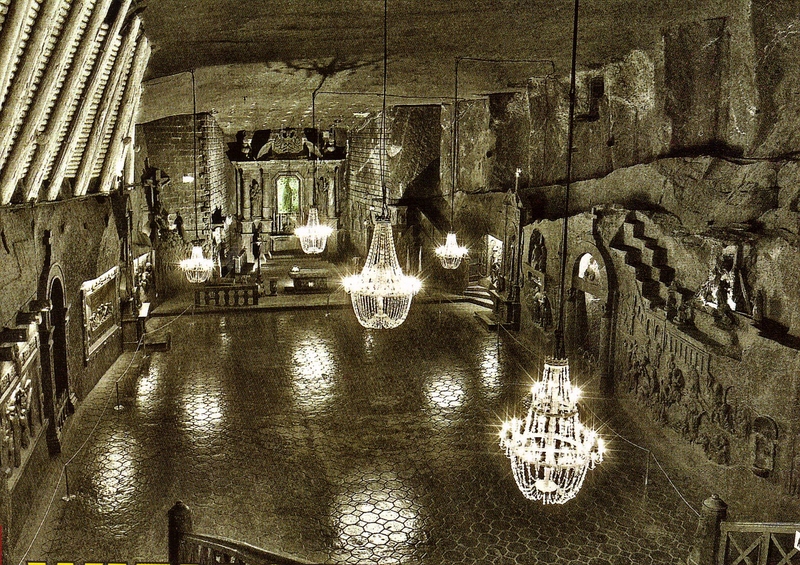 So impressive are the sculptures that in 1978 the Wieliczka salt mine was placed on the original UNESCO list of World Heritage Sites. After we were assigned an English speaking tour guide who welcomed us in a charming lilting voice the visit began with a long descent down a vertical shaft which meant negotiating over three hundred vertiginous wooden steps that zigzagged past fifty-four platforms down to the first level. From here we were about to enter a labyrinth of tunnels and interconnecting chambers that are over three hundred kilometers long and probably puzzling enough to confuse even the Minotaur of Greek legend. We walked through disused and exhausted chambers, passing by whole forests of timber props and retaining walls and through heavy wooden doors to reach the first of the sights, the Copernicus Chamber, where for those of us who were expecting statues similar to white marble we were disappointed by the rather lack luster grey of the rock salt figure and the guide explained that this was due to clay impurities and other contamination in the rock. Down in the mine we walked for three and a half kilometres through a succession of chambers, carved chapels and exhibits that explained the history and the operation. The route took us to a depth of three hundred and twenty-seven metres and down a precise total of eight hundred steps. Almost at the bottom was the star of the show where an entire cathedral complete with a statue of the Polish Pope, John Paul II, had been craved into one of the largest caverns where there was a light show accompanied by a rendition of ‘Land of Hope and Glory’, which to all of us seemed to be a rather strange choice of music. After that there were a few remaining tunnels and chambers and the inevitable gift shops and then thankfully a lift to take us back to the surface, which was preferable of course to having to climb back up the eight hundred steps. The sky was clearing nicely now and blue patches were rapidly replacing the unwelcome clouds and by the time the coach dropped us off on the edge of the old city centre the sun was shining and the temperature was rising. In the square we selected a restaurant for lunch based on the contents of the menu board outside but then managed to find ourselves in the wrong place. We really wanted the Krakow specialty of soup in a hollowed out bread bun so we had to do the embarrassing thing and leave as soon as we had realised the error and relocate ourselves in the correct place next door. Here we were served our preferred lunch where it was fun trying to anticipate how long it would be before the hot liquid would leak through the crust and end up spilling spectacularly into our laps. We wondered if we could attempt this at home but I certainly wouldn’t recommend trying it with a loaf of thin crust Mother’s Pride.